We employ ARC middleware and Open Grid Scheduler for HPC jobs on all of our HPC sites. The ARC middleware provides an opportunity for the user to submit jobs remotely from a local machine. This makes the usage of HPC machines more user friendly because the user do not need login to the HPC frontend machine. We have three visualisation machines. The GPU card of the visualisation machine can be accessed with VirtualGL/TurboVNC pair. With VirtualGL the OpenGL commands are redirected to the graphics accelerator and the rendered images are sent back to the client machine. 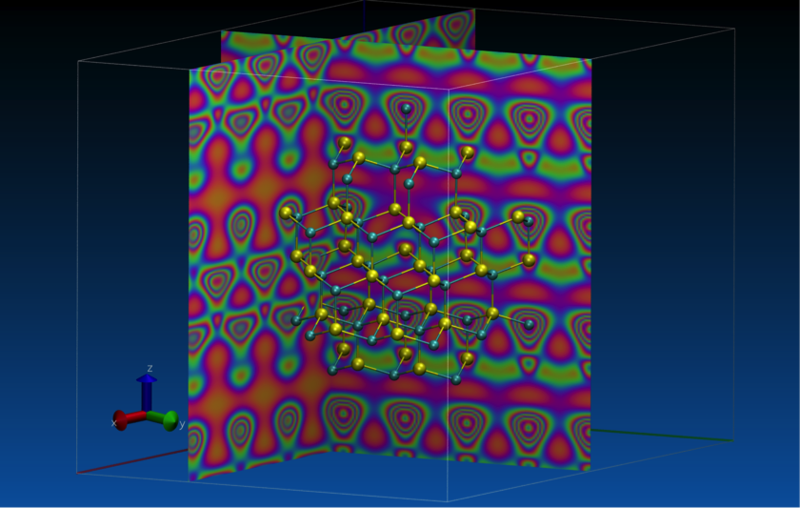 Students will visualize input and output data of the selected material science applications using the VMD visualization package. Quantum Espresso and Siesta are density-functional based packages for electronic-structure calculations Both codes enables the calculation of nanoscale structures at the atomic level. The packages are written in Fortran and utilize MPI for parallel communication. Students have to compile and optimize each code as well as write jobscripts for the scheduler. They will run some selected examples, from small molecules to large bulk systems to measure and check scalabilty and determine the optimal resource requirement. They will visualize input and output data with VMD as well as plot scalability graphs for performance analysis. Electron density of a crystal on different planes. The image is made by VMD.